There are differences in approaching candidates in the B2B versus the B2C space. However, the following general principles apply to all user interviews. How many applicants are required to fill an interview slot? How to reach out to prospective candidates among your user base? How to set up the application form? How to Identify the Right Interviewees for Lean User Tests? The result of any user test completely depends on the selection of the right interviewees. You need to pick the right candidates, or otherwise you will waste resources on a useless user test session. On the other hand, a small group of users drove a large part of the overall sales. Consequently, most of the lean user tests involved two questions: a) how to get new users to make the first and then a second purchase and b) how to keep the regular clients happy, that represented more than 75% of the overall revenue? The acquisition of participants for the user interviews took place by advertising a landing page with an application form. The compensation for participating in the lean user tests was a voucher of the company at a value of €20. This voucher could be redeemed anywhere on the company’s platform. It could also be transferred to third parties. Last, but not least: The value of the voucher could not be exchanged for cash. Not every applicant is suitable for an interview. Even such a moderate compensation of just €20 still attracted applicants, who were only interested in the voucher. Therefore, the number of applicants had to exceed the required number to fill the schedules interview slot by a factor of at least two or three. Thus, we could sort out those applicants, who were not suited for the task, and we could respond in a timely manner to those we wanted to invite. Note: You cannot expect that those who apply—even if you respond to them quickly and inform them about the date of the interview—will actually confirm the invitation and show up to the interview. Email marketing: A list of prospective interviewees was selected jointly with the marketing department and invited by an email campaign. The recipients were mainly customers based in Berlin, who had either purchased many items or who had never bought anything. The emails contained the date and purpose of the user tests, but they otherwise referred to the landing page, where the applicants registered their interest. It took the marketing department usually a week to organize an email campaign. Social media marketing: This acquisition channel was also provided by the marketing department. (And it meant mainly Facebook.) The social media marketing campaigns were a lot less targeted and returned a poor outcome. Messaging: The internal messaging system of the platform in question was by far the best method to target a specific group of users. The selection of those being contacted was controlled by a specific set of rules that were matched in real-time with former customer data. The only requirement for this messaging was, that the client had to log-in to the website. The interviewee marketing started around 3-4 weeks prior to the scheduled user test. The launch depended on the time of year, taking into account school holidays etc. It was the general perception that no lean user tests should be carried out in December and January, as the number of applicants would drop too far below the required number. Also, the number of canceled appointments (or no-shows) would be significantly higher. This also applied to the two weeks before and after the Easter holiday. During the school summer holiday, it is recommended to increase the size of the target group by 20-30%. Market research agencies, that offer professional castings for interviewees. To fill 30 interview slots (at 60 minutes each) for a compact test campaign over a period of six days, we needed approximately 100 applicants. The user tests were intended to support the introduction of a new responsive frontend design in February 2014. The 100 applicants were picked from a group of over 4,200 customers. 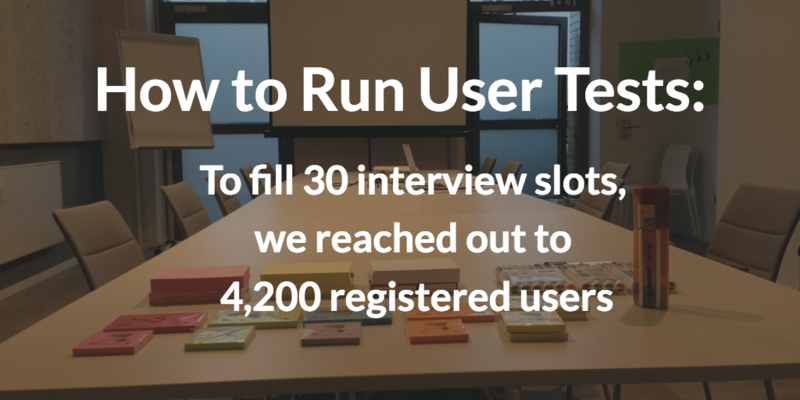 In the end, we had to pitch approximately 140 users to fill each interview slot. Conclusions: Best practices to acquire interviewees are highly dependent on the product and its market. B2C is rather different from B2B. Hence, the “hiring” process usually has a steep learning curve. Therefore, I suggest organizing the first user test sessions independently from each other, so that you can improve your approach from session to session. Never again forget anything necessary to run a professional user test: just download this proven checklist PDF for free, that was fine-tuned over 2 years in the trenches of continuous user testing. To make the selection of the best interviewees as simple as possible, the application form should provide the organizer with information to help you pick the right candidate. Technically, I suggest collecting this data via a Google form. Your benefit is obvious: It’s a tested, reliable solution free of charge and you don’t need to program anything. Forms are a good way to separate the wheat from the chaff: The amount of information, as well as the effort the applicant puts in, are both relevant for choosing the right interviewees. Those, who put more effort into their answers during the application process are most of the time also more helpful during the interviews. Through a permanent dialog with our customers, we aim to optimize our website continuously and make it as user-friendly as possible. We are excited, that you are considering spending 45 minutes of your time with us, to take part in our user testing. Please note, that naturally we are receiving a lot of interest for these user tests. So many in fact, that unfortunately we cannot always consider all applications. We are looking for applicants, who will be most suitable in helping us with certain questions we may have. If you are chosen to become one of these participants, we will invite you personally with a private email. The location of the interviews: In the beginning, when the location of those lean user tests had been openly communicated in the application form, we experienced a few situations, where applicants simply turned up without a prior invitation. In their opinion, the submission of the application form was enough for them to be considered for participation. To avoid this problem, the text of the application form was changed, so that it would no longer show the actual location of the user tests. This didn’t, however, result in a decrease in the number of applications. The participants were just as happy to drive from the west of Berlin all the way to former East Berlin to participate in these tests. The compensation in the form of a €20 voucher: You don’t want the kind of applicant in your user test, that is only in for the money. These participants tend to answer, what they presume the interviewer would like to hear. This regularly leads to false test results and the effect is known as false positives. What is Your Age? Here, we only wish to learn the rough age category. To my experience, most participants cheat about their age by a few years anyway. (Just like on every online dating site.) You shouldn’t ask for the exact birthday either because it may influence the conversion rate of the application form very negatively, as most people don’t actually put in their correct birthdays anyway. Which email address is best to get in touch with you? This email address should only be used for interview-related communication with the applicant and should not be abused for any marketing activities. You should be aware that some applicants will use special email addresses for certain applications, so they can identify a probable misuse easier. Yes, I am a client and have bought things from XYZ. The “Not yet, but I am registered” category was of particular interest in this case: Why bother signing up for a service, but never use it? Why do you wish to take part in a user test for XYZ? The reasons for taking part in user interviews may vary significantly. Applicants, who don’t give a specific answer or who are after the expected compensation or seem to be bored (typical answer: “Why not?”), are not that well suited for the task ahead. You may, of course, add task-specific questions to the questionnaire or questions that refer to a particular group of interviewees that you would like to apply. However, I suggest keeping the questionnaire as short as possible to avoid frustrating prospective candidates. The shorter the form, the more likely people will submit their application, which also is the reason why I like to use pick-lists for answers, thus avoiding too many free text fields. More to this subject can be found in the following blog post by Usertesting.com: “Recruiting Your Target Audience for UX Testing with Screener Questions”. Such an application form based on a Google form can easily be incorporated into any HTML page via its iFrame. This resulting landing page will be used for the interviewee marketing campaigns. Google forms also provide a generic HTML page each that already contains the application form. The URL of this page can be sent directly to your target group via email. This way, you do not have to bother setting up a blog post, for example. However, due to legal or marketing/branding reasons, this should be avoided. This form page, for example, doesn’t contain an imprint and may, therefore, be at risk to cause legal action by a competitor. See you in part 3, when we cover who is a suitable candidate, how to invite them and why you will need replacement candidates.